Give your child options – letting them select which items they would prefer can increase the chances that those foods will be eaten and not thrown away or traded at lunch for some not-so-great options. One example, ask your child if they would rather have apple slices or a banana in their lunch. Banish brown bag boredom by keeping it interesting throughout the year. Let your kiddos grocery shop and pick out new, healthy grocery foods to try. 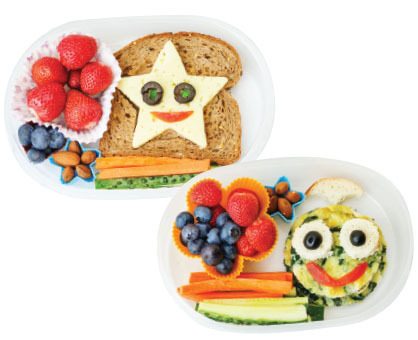 Create a mix-and-match guide with your child for each food category (Fruits, Vegetables, Protein, Whole Grains and Dairy). Come up with acceptable options that are both nutritious and something your kids are excited to pack. Most of us (with the exception of picky eaters) don’t like to eat the same thing every day. Cutting sandwiches and cheese into different shapes using a cookie cutter. Make kabobs by layering lean meats and cheese on toothpicks. You can also make kabobs layering fruits and vegetables, too! If your child won’t eat fruit and vegetables plain, be sure to send a dip! Send breakfast for lunch – a whole grain bagel with nut butter (or Sunbutter for allergen friendly), applesauce, low-fat yogurt and orange juice. Get your child involved in the prepping process. Have them assist you in packing their lunch the night before so they can get excited about making their own food and can look forward to tomorrow’s lunch. Lastly, celebrate special days – for example, send an all red lunch for Valentine’s Day.